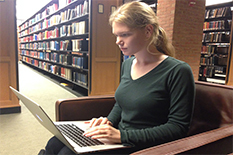 When Margaret Kandel, a Language Sciences major from Yale University is not in the lab, she is taking walks, traveling or tutoring at the Yale Writing Center. Kandel just completed a scholarly stint at the University of Maryland Center for Advanced Study of Language (CASL), in which she authored a manual for K-12 level teachers. The manual, which accompanies the new language tool Langscape, was part of her scholarly work at CASL. Langscape is one of a growing number of multidisciplinary, public-facing research applications that allow members of the public and the language education industry to easily see, hear, compare and learn thousands of world languages online. It is a Geographical Information System (GIS) that provides mapping for over 6,400 languages worldwide. The map is also linked to detailed information about each of these languages, integrating information from different data resources. Kandel’s K-12 manual accompanies this tool, which is coordinated by the Maryland Language Science Center. When approached by Tess Wood, Assistant Director of the Language Science Center, about writing a primer for the K-12 level, Kandel jumped on the opportunity, as she does not want students to miss a chance to realize that language science is a field they want to pursue. “In addition to providing an introduction to the ideas of cultural and linguistic diversity, Langscape can also introduce students to (and get them interested in) the language sciences,” says Kandel. Kandel chanced upon the field of language science during the second semester of her sophomore year. She initially took a language science course just to get a social science distribution credit. “By the end of the semester, I knew I was hooked, and I decided to switch my major to linguistics,” Kandel says. She feels that although it is easy to imagine the use of the Langscape resource at the college and university level, language sciences are not often thought of as a part of the curriculum for K-12 learners. Kandel says that the greatest challenge in developing the manual was to devise a way to integrate Langscape as a potential resource into the pre-existing curriculum so that students can pick up the ideas of language science and language diversity within a classroom setting. “I researched national and international learning standards and goals including the U.S. Common Core Standards and looked into the DC Educational Standards as a sample K-12 curriculum,” Kandel says. Then, Kandel found ways to connect Langscape to these standards. An additional challenge, she adds, was that Langscape is still a growing resource. “As the content and functionality of the database continue to expand, there will be many new ways to incorporate Langscape into the K-12 class setting in the future,” she says. Awareness of linguistic and cultural diversity is very important, Kandel says. Kandel also attended her first linguistics conference in downtown Baltimore and learned how to design and run linguistics experiments while working in UMD’s Cognitive Neuroscience of Language (CNL) Lab. “I was able to witness the behind-the-scenes work that goes into the development of linguistic resources and research papers,” she says. Kandel’s other interests include arts, crafts, skiing, swing dancing and, not surprisingly, learning foreign languages.